The Organic Farm Management Handbook is the only source of up-to-date information on the costs and performance of organic farms and related management information for farmers, advisers and others concerned with the management of organic farms. This is a ‘must have’ publication for everyone interested in the business of organic farming and growing. The completely revised 10th edition is published by the Organic Research Centre at a time when confidence in the organic market and growth has slowly started to return. The handbook contains a summary of the outcomes of the reform of the Common Agricultural Policy at the EU level and summary of scheme proposals under the new rural development plans from 2014/15 in all parts of the UK, particular as they related to organic conversion, whole farm profitability of organic farms and environmental support. In addition to updating the text and margins in the light of recent trends, the new edition includes data on long-term trends on the farm incomes of organic farms and a new section on nutrient budgeting. The handbook draws on the experience of a wide range of contributors from the organic sector. Edited by Nic Lampkin, Mark Measures and Susanne Padel. Order individual copies for £20 plus postage (£2 in UK, £4.00 overseas) here or call: +44 (0)1488 658298. Please e-mail elmfarm@organicresearchcentre.com for discounted bulk/trade order prices. 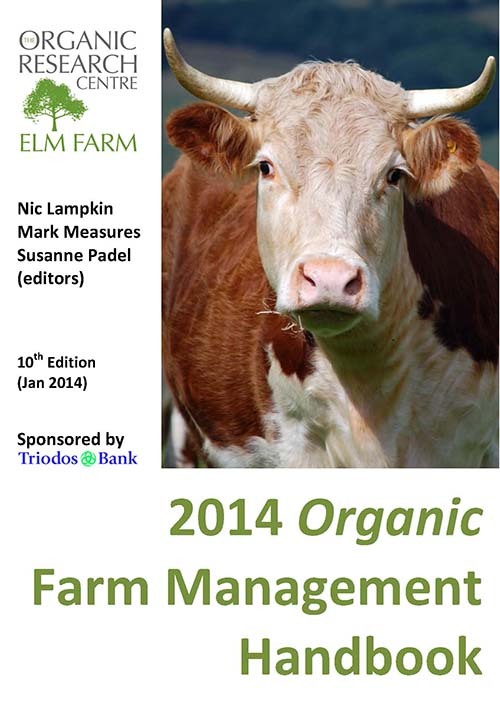 The Organic Farm Management Handbook was first published in 1994. To order a review copy please contact ORC with details of the review.